Do Dogs Know That You're Pregnant? (If your looking for info on pregnancy and related topics, then this is the site to visit! Ever noticed just how much your dog knows? Dogs tend to pick up on things that we might not think they would notice, and sometimes they do it long before the humans in our lives catch on. When you’re pregnant, your dog might be able to sense changes in you, whether those are physical or emotional. Some breeds notice the first weeks of pregnancy much more than others do, while others might be aware of what is happening but choose to ignore it as long as it doesn’t affect their day-to-day lives. If you are an animal lover, you probably already know that our furred and feathered friends can typically sense things before they actually “know” them. Dogs might not understand that there will be a new human in nine months, but they are especially attuned to their owners, and they understand that things are changing. They might see that your movements are becoming more awkward, and that you are more tired than usual. They might be able to tell that your emotional mood has changed from one day to the next. So exactly can dogs sense pregnancy? Ask any mom-to-be whose golden retriever is suddenly more protective than ever, or ask that new mom if the corgi is a little clingy these days. Dogs can tell when things are changing, and pregnancy definitely changes things. Can Dogs Sense Pregnancy?If you are an animal lover, you probably already know that our furred and feathered friends can typically sense things before they actually “know” them. Dogs might not understand that there will be a new human in nine months, but they are especially attuned to their owners, and they understand that things are changing. They might see that your movements are becoming more awkward, and that you are more tired than usual. They might be able to tell that your emotional mood has changed from one day to the next. What Are the Behavior Problems That May Occur? But keep in mind that your dog knows change is coming. He sees all the new things around the house for the baby, and he smells all the new things too, like that powder for the baby’s diaper change or the scent of new paint in the nursery. When these changes happen, your dog might strike back in his own way by chewing up things that are meant for the baby, sulking around the house, urinating in inappropriate places, not being cooperative, or being more demanding. These behavioral challenges are common when a dog senses that a change is about to happen, and that there might be something about that change that pushed him “out” of the family unit. 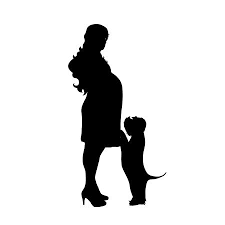 Fortunately, there are many ways to help your dog adjust to the pregnancy and the impending arrival of a new family member. Here are a few ways to make sure your best friend remains just that, and doesn’t turn into a sulking, depressed shell of an animal. If you want to make absolutely certain that your dog doesn’t feel as though he is being pushed out by those changes, make sure to watch your body language. When you cover up your belly, it tells your dog to ‘stay away,’ but when you let him snuggle with you, it tells him it’s okay to be close. When you don’t take him out as often, he might start to feel neglected, so make sure that there is someone who can help you with the day-to-day things your dog needs. Make sure to spend special time with your pup, so that as things change, he will have a grounded feeling about the things that are happening, and he will feel secure in your household and heart. Now is a great time to put your dog through obedience training. If he has already done this, a refresher course is the perfect way to reassert your dominance in the house and make it clear that there are things expected of your dog. If you are in the beginning stages, you can do this on your own, but if you are in the later stages of pregnancy you might want to pair up with your partner for these training courses. This is actually great for your dog because he’s a creature of habit and structure. The more structure he has, the more likely he will be to settle down and relax about the changes happening around him. Those who love dogs understand the hardships they might face when they sense your pregnancy. Many areas have organizations that focus on dog counseling for families, and this can help everyone deal with the stressful changes. It can also help avoid the annoyances that a dog might feel when the new family member comes, and it can aid the parents in learning how to make their pet feel just as loved, even when there is someone new in the house. Your dog is a part of the family who needs to feel as though he will never be replaced. Even when your dog senses your pregnancy, these steps will help ensure that he doesn’t have a meltdown because of it. But just when a dog needs structure most, the baby arrives and throws the whole household into chaos for a while. What can you do to make things more flexible for your dog and not turn him into a wild animal who is uncertain of everything? Start by varying your dog’s feeding time a bit, changing it by an hour here and an hour there. That way he will become more accustomed to the idea that he will be fed soon, but maybe not right this second. This comes in handy when the baby is very young and your schedule is in chaos. You can also exercise your dog at strange times, so that he will become used to the idea that things are going to happen with a certain flow, not a rigid schedule. To make it all even easier, install a doggie door so your dog will never have to wait for you to come and walk him. If you own a dog, you've heard this rule: 1 year for Fido equals 7 years for you. Turns out, the math isn't that simple.